Hi! To get started (in 1993) I sort of copied the homepage of my daughter, Sandi Wiggins, as she knows what she is doing and I don't (still). (see her Acoustic Neuroma website below). I got some of the info I needed to get started on HTML , as well as step-by-step page design, from CNET. Since 1993 the methods for creating web pages have been greatly simplified by templates and software (but you don't need either to create a web page/site). I also have a book wwhich I highly recommend (among the many that are out there) called "Teach Yourself HTML Visually". Available in most book stores in the computer section. First, a little boring stuff about me and then you can get on to the really exciting stuff! I am an 86-year-old male recovering well from removal of a non-malignant brain tumor, and more recently, from heart valve repair and a triple bypass. And still later (2000) prostate cancer, treated with seed implants. More recently diagnosed with diabetes, Type II. (You wanted to know all that, didn't you?). I think this computer stuff is therapeutic. I am self-taught on the computer using books, on-line help, and occasional advice from my grown daughters. This only proves that anyone can do it. I am interested in all kinds of things. Airplanes, powered parachutes, ultralights, oil painting, reading, writing (I wrote a 408-page autobiography), NASCAR, boating, NFL(Steelers Rule! ), computers (natch), web pages, surfing the net, e-mail, ALDs (Assistive Listening Devices), whimsey bottles, camping, fishing, and just traveling, to mention a few. I do a bit less after my surgeries. My Own Personally Created Websites/Pages. List, compiled by this author, of remaining Ford Tri-Motors This diminishing breed is located for your information so that you may still take the kids to see one of the great old airplanes which led to the founding of many of our present airlines. Page leads to many narrative stories (with Ford photos), written by the author while barnstorming in the '80s. I have just published (October 2009) a book entitled "Chasing the Goose" detailing some of the adventures of this barnstorming trip. To see the book, read an excerpt, and place orders go here.. Two others of my books (Nutt Avenue, The Right Way Two) may be seen if you go to the upper right of that page and type the book names into the search block provided. A new site with lots of great pictures of airplanes circa 1915. They were scanned from a photo album carefully maintiained by my father-in-law, Bob Fitz, during his time in the Army Air Service in the early 1900's. Many pictures are original, some from Air Service files. Lots of very early airplanes, military and civilian. Acoustic Neuroma Physicians. This is a patient-driven list of doctors and hospitals, as compiled by the author, and providing some of the phone numbers, e-mail addresses, and internet pages that may be of some help to recently-diagnosed patients just starting out on their quest for AN knowledge. Acoustic Neuroma at House My personal experiences at the House Clinic in Los Angeles (in answer to many requests for information). 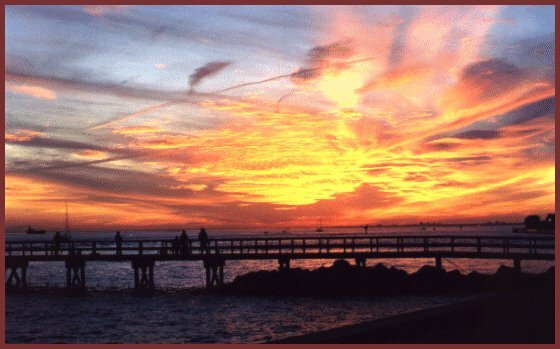 Central Virginia Acoustic Neuroma Support Group This page is no longer being updated but is being kept open as a source of information on past activities in the Richmond/Tidewater area. Whimsey Bottles Only learned this term recently myself. The link leads to a story about an old murder, the resultant 1883 "man-in-a-bottle" in my possession (pictured), and the two-page newspaper article with details of the disputed trial. The link also leads to much more on "whimsey bottles". As of January 2009 I just published my first (and probably last) fiction novel ("Nutt Avenue") about the murders cited above. You can read an excerpt and/or order the book at here. The two sites listed here Alaska Tour Page 1 and Alaska Tour Page 2 contain pictures from a trip my wife and I made in July 2003.
nostalgicaero This site shows old "Popular Aviation" and "Flying" magazines which I offer for sale (Including the first magazine I ever bought - the November 1937 issue of "Popular Aviation" bought at a newstand for 25 cents). Also included are a number of WWI manuals and pamphlets, some are of the LeRhone Rotary and the Liberty engines. Southminster Presbyterian Church, Richmond, Va. My home church. After nearly 8 years of my developing and managing this site it has now been turned over to a new webmaster and has been redesigned. The original site is still available in archives. Stockton Memorial Baptist Church, VA. Site which I created for the church. Church members have now taken over managing the site. The address remains the same but I am no longer involved in the site. Home page for the Wiggins family (of which I am but one). Wiggins Genealogy. An offshoot of the above Wiggins family site. Wiggins Nostalgia Photos. An offshoot of the above Wiggins family site. Pictures, most of them over fifty years old. George's Cards. A site offering note cards which showcase the photographic skills of my brother-in-law. Unique and unusual cards direct from the photographer. Barbara's Cards. A related site offering note cards by my niece who has Usher's Syndrome but nevertheless is able to make quite nice pencil drawings which she turns into note cards. Just a Helping Hand A site that provides an easy way for church members to contact others who may be in need of some small repair or service. Skydive anyone? What I did on my 80th. And don't miss the video. Pepperberries.A site which was developed for a Pennsylvania gift shop specializing in unique dry-flower floral arrangements, plus many other gifts and related products. Note: This site will be moving to a new host and a new site designer soon, probably on Sept. 15, 2008. After that I will no longer be involved with the site. The website address will remain the same. And Finally, What You Have All Been Eagerly Waiting For - My Blog! Which can be found at: The World According to Art. All The Airplanes in the World! This very interesting site lists, and shows photographs of, any airplane you can think of and hundreds more that you never heard of. A good way to spend an entertaining evening trying to think of one that is not pictured. Sandi Wiggins' Acoustic Neuroma Resources Page dealing with Acoustic Neuromas, a form of brain tumor. This page provides links to carefully researched information that is proving valuable to people all over the world. WebMD Drugs and Medical Information. This site provides a link to data on nearly all prescription drugs. It also leads to a wide variety of health links allowing you to obtain information on most medical conditions. The site for the Air Force Museum in Dayton. See pictures of all the fine machines on display there. This really great site (esp. for aviation history buffs) features prop planes and comes to us from the Netherlands. Lots of great pictures. Be prepared for a long night at the computer in order to read all the interesting sub-sites and pages. Illustrated history of the Fourth Fighter Wing which has figured so prominently in many of our wars. I was a Staff Sergeant crew chief in the 335th Squadron after they transitioned from Republic P-47s to the Lockheed P-80 Shooting Star jet in 1947/48/49 and when they again changed to the North American F-86 Sabre in 1949. For those of you seeking more information about ultralight aircraft visit the site of the Hummingbirds Club. If you live near enough to Richmond, VA, you are also welcome at any of the posted events. 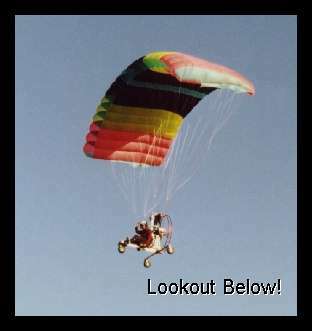 Information dealing with Powered Parachutes, a type of flying machine that you can be flying after only one day of instruction. There is no license required, no physical exam, and no minimum age. I have video of a 12-year-old girl flying one. I am a factory-certified instructor on ParaPlanes, one of numerous brands. And, lookout! Here comes Art in one now! Created July 15, 1997. Updated May 30, 2014.